For as long as I can remember, I have always loved imagery that took a different spin on an original story so I decided to attempt a piece based on Snow White, going back to the original Disney version - only darker. The recent one portrayed by Kristen Stewart really put me off. So below, we have the final version of the image that I had envisioned in my head (plus or minus a few tweaks here and there). All up, I spent about 4 days in photoshop putting together various different elements to make up the final photograph/composite. 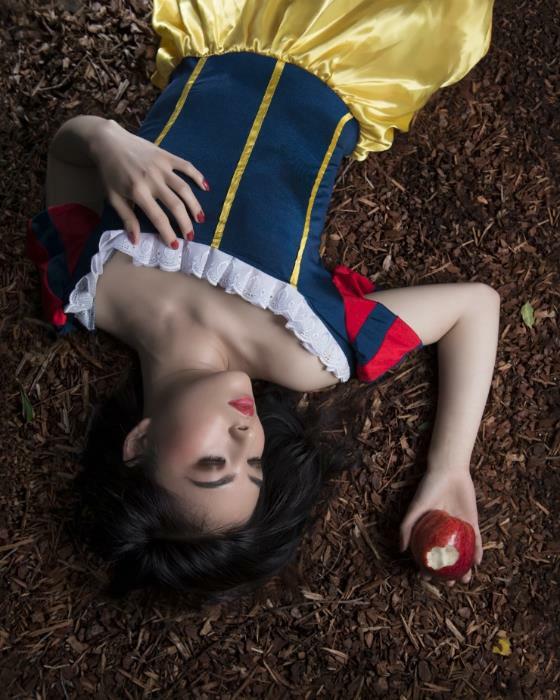 Before I go on with the behind the scenes stuff, I'd like to say a big thanks to the model Judy, who really nailed the poses and expressions that I was going for, and for coming along with her Snow White costume. And also Adriano, a friend I dragged along to the shoot to be my VAL (voice-activated lightstand) who managed to learn how to "feather" light over the course of the afternoon having never done much photography before. I couldn't have realised this shot without these 2 individuals being involved. We started the test shots at around 4 PM and by the time we started really shooting for real, the ambient light had dropped by 2 stops, which was huge. Being under the cover of multiple trees, there wasn't much ambient light to play with so out came my 2 trusty Nikon SB-910's to save the day. One of them was in a 26" softbox and the other rim light had a Gary Fong light sphere mounted on it, to spread the light in all directions so it was easier to get rim light that showed up everywhere as opposed to carefully aiming a flash. It was a cheap hack as there wasn't enough time for me to run back and forth adjusting light angles. The first hour was spent taking portraits and trying different backdrops to see which ones worked the best. Over 200 shots were taken and I filtered that down to just 2 shots that I was happy with. The following sequence depicts the work that went into the post-production of the shot and several key landmarks that changed during the process. The painterly look I was going for with Snow White was to follow the quote by The Brothers Grimm: “Skin white as snow, lips red as blood, and hair black as ebony.”, and that to me meant porcelain white skin, blood red lips and a complementary colours that really worked well together. The original shot straight out of camera. The first step was to do a careful skin retouch without killing pore detail with the healing brush tool. This was followed up by a masked surface blur layer to smooth out any uneven skin tones - set to the "colour" blending option. Then the porcelain skin effect came into play by adjusting the hue and saturation, followed by a curves adjustment layer to lighten the shadowed areas via masking, so it just affected the model's skin. A light pink blush and brown eye shadow was added at this stage to the face to enhance the makeup on the model. The next thing to do was to remove the distracting green leaves (image left) which I thought were interesting during the shoot but later felt that they did not fit into the composition all too well. The Clone Stamp was used here to quickly replace the leaves with more background space - nothing fancy. Perfect Effects 4 was used here to apply tonal contrast to just the background wood chips to make the gorgeous texture really pop. Porcelain skin rework and leaves removal. The background at this point was too bland for my liking and required some complementary colours to spice up the image. So I went out looking for dried Maple leaves and composited them into the shot. This also provided our Snow White model with a subtle framing effect. Maple leave elements taken on a white board post shoot. Next came the task of masking out all the maple leaf photos I took and to find the right composition for them in the shot. This had to be the longest and most tedious part within Photoshop. After masking, the shadows were added back as a layer beneath the leaves layer as a multiply layer to make sure the leaves looked grounded and part of the scene. The leaves blended too much into the wood chip background and I needed them to pop and complement the scene more. So I colorised the leaves to add some red variations to add more complimentary colours into shot, via a hue/saturation layer. Since there were deep oranges and yellow in the leaves, I painted the skirt of the model to add orange hues into the shadowed regions to make the skirt appear more gold as opposed to just a flat yellow. I feel this enhances the richness of the colours and works a lot better. The skirt also had a lot of wrinkles which I just painted over (by sampling nearby colours) with the brush tool to give it a smoother, silkier look. Some warm light was also added at this stage to spice up the highlights a little. The skin was given a very light dodge and burn to enhance the contours. Adding and colorising the leaves. Painting over the skirt. The last few remaining steps were to give the shadows the right hue - especially the skin - and also to tweak the contrast levels a little to bring out the blacks. I felt that the lighting required more "pull" towards the face and the apple so a dark vignette was added to draw the eye to that area. Perfect Effects 4 was again used here to do a final tonal contrast boost and colour tints to the entire image. This was followed up by a square crop to finalise the image. I hope you managed to get some useful ideas from this post for your next project. Please share this post if you liked it so others can appreciate the effort that went into the creation of this image. Thanks!